When we talk about coffee farmers, we talk about farmers in general. This is in line with what Jeffrey Neilson said in our early edition, “There is no such thing as coffee farmers.”This is because coffee is only one of several commodities to support the farmers’ livelihood throughout the year. Therefore, when we talk about female coffee farmers, we must observe it from a wider perspective, beyond the role of coffee sorter which is identic as a woman’s role, to their domestic and social role. In a village on the foothill of Semeru Mountain, a local movement called Sidomakmur, which was initiated by female farmers, gets stronger. Located in the Pasru Jambe Village, Sidomakmur becomes a space for learning and knowledge-sharing for women and men. Started with the spirit to fight poverty, Sidomakmur grows into an organization that is critical towards government’s program, including feminism issues. Female farmers in Indonesia are indeed still bound to their domestic duties and has no ownership rights over the land nor the production equipment. For example, land registration is often conducted under the name of men, and most of the times, land inheritance is passed down to male heirs. In the households, when there are challenges in providing food, the first to blame is the women. Then, when children and husbands seemingly neglected, the blame is always on the mothers. Women, whether they like it or not, would be the last to sleep, but the first to wake up, to ensure the whole domestic matters – from preparing breakfast, taking care of the children and the husband, cooking, washing, and then going to the field – all taken care of. Not to mention, the large scale land acquisition and farming industry corporations play a major role in shifting access and control from the farmers, while causing massive dependency for a very long period of time. On top of that, women who do politics and are active in organizations are considered failing their main obligation as housewives. Hence, women barely participate in decision making in any village organisation. In fact, women who are members of Sidomakmur still get labelled as “wild women” or “rebellious women”. However, this does not stop them. Sidomakmur initiated a family farming system which produce healthy produce, with the intention to improve the economy of the family. They believe that healthy produce will result in healthy families, avoiding them from the danger of any illnesses. A female farmer called Usrek from Lumajang, East Java, is one of the initiators the Sidomakmur community. One of the commodities farmed is coffee, considering the soil condition are appropriate for this type of produce. The land which is used to farm is owned by the organization. They acquire the land from the money that the organization saved every month. The management will gain 60% of the profit, and the remaining will be fairly distributed to the members. grinding, to drying. “Before I go to teach, I come to harvest the coffee, dry them, grind, sun dry, grind again, and then fry the coffee,” said Septi, a caretaker in Sidomakmur. In the production and marketing distribution, each member has tasks and roles that have been agreed upon unanimously both for and by the men and the women. they bring fertilizers or their harvest. The middlemen also set a very low price for their coffee, as low as Rp25.000/kg, to be resold to the next chain at Rp100.000/kg; an inequality that is unfair to their hard work. This is a great challenge for Sidomakmur community, where farmers in the village refuse to sell their coffee directly. Therefore, when they experience a shortage in food supply, they are forced to repurchase from the middleman with double price. The type of coffee they packed are Jambe coffee which is a mix of coffee and areca nuts, pure coffee and corn coffee, a specialty of Lumajang. 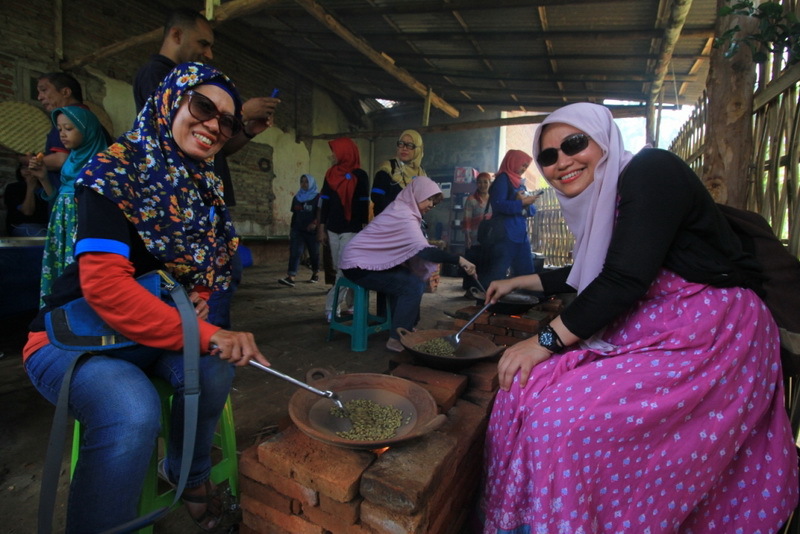 Coffee, for female farmers in Lumajang, is not only for sale but also for their domestic consumption. The selling price is quite low, Rp10.000/pack (200 gr) at the maximum. The income will be divided accordingly to the contribution of each member. Those frying the coffee are paid Rp30.000/kg, the marketing division will receive a share of the selling price; when it is sold for Rp10.000, they will receive Rp2.500/kg. The remaining income of Sidomakmur will be put aside as the communal saving. There are 12 people in the production and marketing division of Sidomakmur. The type of coffee they packed are Jambe coffee which is a mix of coffee and areca nuts, pure coffee and corn coffee, a specialty of Lumajang. 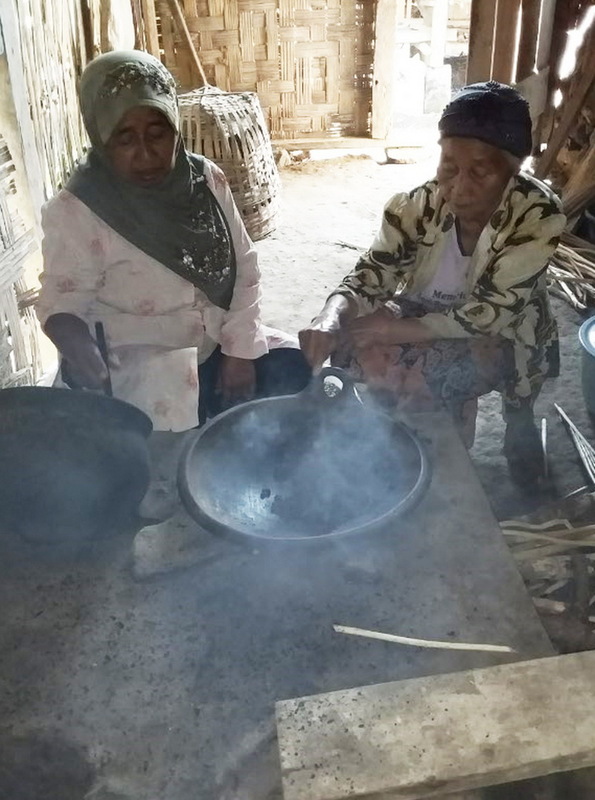 Coffee, for female farmers in Lumajang, is not only for sale but also for their domestic consumption. Women farmer in the Regency of Ende in Nusa Tenggara Timur – of Tananua Flores Foundation – also farm coffee in their lands. Unlike the Sidomakmur group, coffee in Ende was selected because it generates income that can sustain household economic stability, including to pay for children’s education, healthcare, and others. In average, each farmer’s family has a hectare of land. The type of coffee they farm are Robusta and Arabika. Traditional coffee processing, which uses mortar, is done by women, while machine processing is done by men. Nearly the entire process of coffee farming is managed by women, starting from planting, harvesting, to distributing. Traditional coffee processing, which uses mortar, is done by women, while machine processing is done by men. Coffee processing using mortar is still conducted by more than 50% of the farmers. Although it is conducted in groups, the whole process such as grinding, fermenting, washing, and drying, sorting, to selling, are conducted independently by those farmers. The harvest will be sold to the middle men in the village and regency and also to the UKM Tananua Flores in the form of coffee powder called “Kelimutu Coffee”. For their own consumption and social necessity such as festivals and other family events, they set aside around 50 kg a year. Organizations play such an important role as conduits in strengthening the layers of female farmers in Indonesia. It is a supportive medium to learn, work, and create beyond boundaries. Of course, it is also a space to maintain solidarity and to face various hardships in their daily life. Whatever its form or name: community, group, union, etc, the most important thing is how women can have a platform to be heard, to be considered. In this regard, the story that has been portrayed is how coffee could become the selected commodity of collective production for women to achieve economic independence. KRISTINA PAKPAHAN is an anthropology graduate who works at Bina Desa as aresearch staff. BINA DESA is an organization that has worked with various rural communities since 1975 and believes that the individual’s potentials are the main resource to build sustainable villages.